Boomstick Gun Accessories brand electronic earmuffs make the perfect companion for the woods, job site, or firing range! They feature a low profile design along with an adjustable headband and padded ear cushions, offering all day style and comfort. Boomstick Gun Accessories brand electronic earmuffs make the perfect companion for the woods, job site, or firing range! They feature a low profile design along with an adjustable headband and padded ear cushions, offering all day style and comfort. Utilizing high frequency directional built in microphones, to amplify sounds by up to 6 times, this headset allows for hearing animals walking around while hunting or commands on the range. If the sound gets to 82 decibels then the microphones automatically shut off and they become ear protection with a NRR of 22dB. This means you can hear the animals, shoot, and your ears are protected from the loud gun fire. It's the best of both worlds! These run off of 4x AAA batteries which are included. They also feature a 3.5mm input jack for listening to audio devices (Phones, Scanners, etc, cable not included). 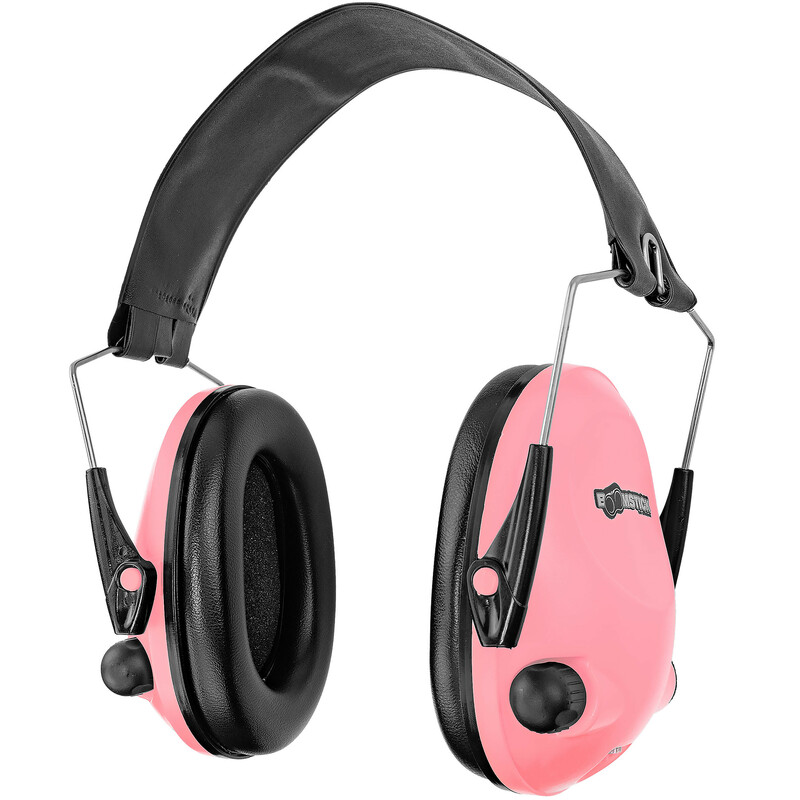 Earmuff color is pink. Overall dimensions when folded for storage are 4.05" x 3.83" x 4.70".